This special issue looks at the constantly changing face of education in the world today. Topics covered include educational values, cross-cultural studies, leadership, social impacts, and the role of technology in education. Volume 73, Number 2, 1998. Contents: P. Hallinger,K. Leithwood, Editors' Introduction. K. Cheng, Can Education Values Be Borrowed? Looking Into Cultural Differences. K. Leithwood, D.L. Duke, Mapping the Conceptual Terrain of Leadership: A Critical Point of Departure for Cross-Cultural Studies. R.H. Heck, Conceptual and Methodological Issues in Investigating Principal Leadership. 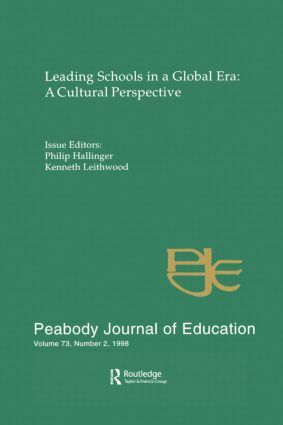 A. Walker, T. Quong, Valuing Differences: Strategies for Dealing With the Tensions of Educational Leadership in a Global Society. K. Wong, Culture and Moral Leadership in Education. K. Leithwood, Unseen Forces: The Impact of Social Culture on School Leadership.